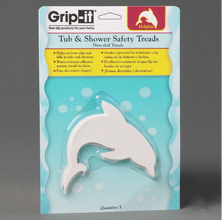 Grip-it Tub Treads help prevent slips & falls in tubs and showers. Water-resistant adhesive secures Tub Treads in place. Available in decorative shapes or traditional strips.